Since I first sang the praises of my friend, soprano Heidi Melton on jcm, she has moved several steps closer to the exposure that her prodigious gifts hinted at. I’m very excited to share with you (Melton fans and newbies alike) my new e-interview with her: she, in Berlin, sidled up to her laptop with frosty brew-in-hand, and me, in San Francisco, eagerly awaiting her return to SFO, in 2011. Ah, it’s the next best thing to sitting down in-person at a pub! jcm: What is your very first memory of singing or performing? HM: I suppose that my first memory of music would be of my grandma sitting next to me on the piano bench, teaching me how to play. It is how I spent the majority of my formative years, and was very gratifying. jcm: Are you from a musical family? Or, were your gifts helped along in any way in your childhood home? HM: My family has always loved music, although not necessarily opera. But, they have really started finding an appreciation for it — except for my sister, who still feels that opera sounds like someone is stepping on nails! My grandma went to college for piano performance, so that was always a part of my home, but I will admit to not really discovering opera until I was about 14 or 15.
jcm: Have you always been on track to be a performer, and when did your trajectory shift towards opera? HM: When I first started applying to undergraduate schools, I did so under music performance and music education. I applied mostly to state schools in Washington, but I had my one “pie in the sky” school, which was the Eastman School of Music. I was accepted into Eastman, but only as a music education major. I wasn’t good enough to get into their performance program. Anyhow, I’ve never been good at accepting a “no,” so I worked hard and juried into performance, and haven’t looked back. jcm: When did it become clear that your voice was that very special and true dramatic soprano, like one of your favorites, Régine Crespin, or perhaps even a Hochdramatische (“heroic”), like another favorite, Astrid Varnay? Is it a pressure, or instead empowering to know you hold this rare gift? HM: It does seem to be heading in that direction, doesn’t it? I do consider it a gift, and with any gift comes responsibility, so I am just trying to do all that I can to ensure that I give “the beast” everything that it needs to be the best it can be. But to answer your question, it is both a pressure and empowering. My friend Heidi Melton now has a footprint on youtube. 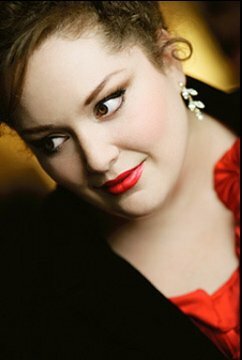 After understudying Alceste for Christine Brewer at Santa Fe Opera, and Chrysothemis for Debbie Voigt at the Met this winter, she’ll continue to emerge as THE leading dramatic soprano of the next generation. Someone in france recorded and has just posted excerpts from her recital, likely from the same time as her Amelia, in last season’s Un Ballo in Maschera at Opéra National de Bordeaux. Although a “pirate” recording, and perhaps not sanctioned by the artist, this is a wonderful introduction to her art, for those who haven’t had the pleasure of experiencing her live. Even though the sound quality is not ideal, her voluptuous bottom and molten top are in full display here. Be sure to listen to her other three videos posted as well, either in the youtube “Related Videos” or in my vodpod sidebar widget. Stay tuned for news of her October recital for LIEDER ALIVE! at the SF Conservatory of Music (details not yet available). It will be her last Bay Area performance for some time, as she will then be on her way to New York, and Berlin in ’10.